Hotel Enjoy , 1 star in Riccione, offers a "youth-friendly" welcome with services designed for young people. Air conditioning, WI-FI, products for coeliacs. Admitted animals of small and medium size. 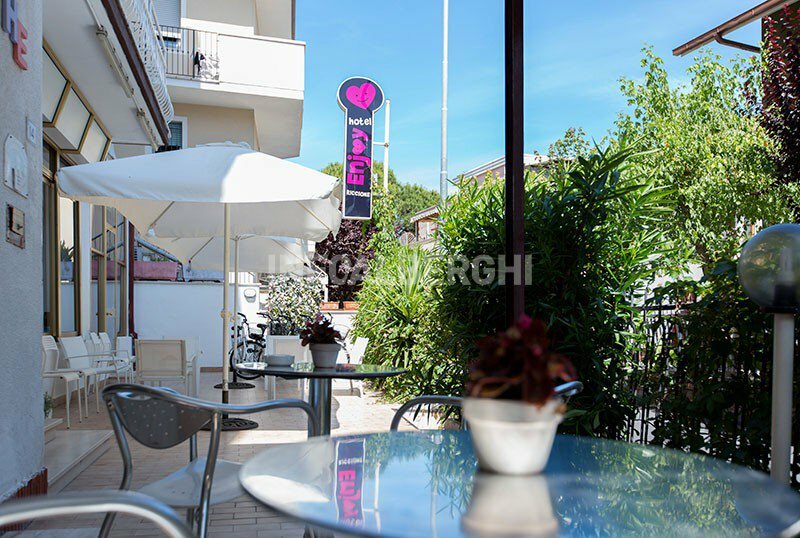 The property is located in Riccione, a few minutes walk from the beach and the central Viale Dante. Able to accommodate from 2 to 6 people have air conditioning, digital terrestrial TV, WI-FI, private bathroom with shower and complimentary toiletries. Almost all of them have a balcony or a small balcony, a hairdryer is available upon request. Possibility of adding a crib for the little ones. Free bike rental, open-air porch, bar, TV room, elevator, beach towels available. PARKING: not present in the hotel. AIR CONDITIONING : present in the room and in the common areas. CONVENTIONS : beach, amusement parks, discos, waterslide. Free admissions to the Beach Village water park. BREAKFAST : international with homemade desserts, served until late. LUNCH AND DINNER : possibility to have lunch and dinner at the nearby Hotel Astoria choosing between two meat or fish menus, inspired by the Romagna tradition. Always included water, wine and soft drinks included in the all-inclusive formula. OTHER: table seats, baby food and baby menus available for the little ones. The Hotel Enjoy has an agreement with the Bagno n. 117. At the beach there is a heated swimming pool, hydromassages, entertainment, WI-FI, playgrounds, ping-pong, table football.